The trouble with most New Year’s resolutions is that they are almost always doomed. They are unrealistic and wholly out of character. And of course any less-doomed resolutions made at the same time also tend to be discarded by association. Not that we should ever too easily concede that our most deeply cherished dreams are impossible. It’s often our job after all to dream dreams for a living and to capture other’s dreams in print. You could say that dreams constitute our raw material. They creatively nourish us and keep most of us moving forward. It’s just that making them into a resolution this time of year tends to add an unnecessary extra weight to them that few of us can comfortably shoulder. So – is it even worthwhile to consider making resolutions? Yes, I believe it is – but only if they are sensible decisions, consistent with your character, that you would be making anyway regardless of the New Year. I view this time of year as a kind of inventory-taking period. What I’m doing, what I’ve done, what I hope to be doing. You could do it at any time of the year and as often as is useful to you. To get you started, here are some highlights of my so-called resolutions for the year ahead as they relate to my freelancing work and lifestyle. * I WILL learn another new skill set. Last year I learned some new recording and editing software apps. I didn’t really have cause to use them but studies have shown learning new skills is good for keeping your grey-matter tuned up. So I guess it’s time I started tuning up again. * I WILL attend more workshops and lectures. Again, this will help keep my grey-matter tuned up. And it is often a great source for story ideas and research. * I WILL spend more time browsing my local library. The internet is awesome but your local public library can be even more awesome. It has resources and staff highly qualified to help expand our knowledge base and pursue story ideas. Browsing can expose us to books and authors and ideas we had no idea were even there. For a freelancer there is also something positive and healthy about getting out of our tiny apartment or basement office space and into the so-called real world. Libraries are perhaps the most welcome and inviting first stop into it. * I WILL contact at least one of my professional heroes. They won’t be around forever and it is important to let them know what a positive impact they have had on me and my career. Freelancers are only as isolated as we choose to be. If you choose to reach out you will sometimes be rewarded with feedback from fellow professionals you grew up admiring and wishing to emulate. This can be so important for our professional development. I’ll write more about this in a future post. * I WILL contact at least one novice in my field that I am aware of and offer encouragement (assuming it is merited). They may not care but I know when I was starting out any kind words were always appreciated. A few such sources became unofficial mentors. Perhaps now is the time to return the favour and give something back to the universe. * I WILL remember to back up my data on a regular basis! Many of you may have auto-backups on your computers and they are great. I still prefer to back up manually which is bit of a pain but it means I can sort and prioritize my material and delete a lot of dead weight material that I don’t require as I’m backing up. (Keeping in mind never ever to delete anything that might one day be useful.) Also, I prefer my own physical backups because I simply don’t trust clouds. They can be here one day and gone (or unreachable) the next. * I WILL strive to take better care of my number one asset as a freelancer, my health. I have in fact made an appointment with a dietician to review my diet. If we get sick, our income can take a significant hit. Do you have private health care to supplement your provincial service? Given all the cutbacks these days it might be worth investigating. Membership in the CMG entitles you to apply for such coverage. Check it out! * I WILL review my finances. Is my RSP maxed out? Is my TFSA? (If you don’t have either, why not? It’s never too late to start. And if you don’t know what they are, you’d better start finding out immediately.) If you have a financial consultant, now is the ideal time to see them and review your status for the year. We freelancers must be extra vigilant when it comes to safeguarding whatever savings we can accumulate because we can rarely rely upon ongoing revenue streams. * I WILL try to feel more grateful in every way this year. As a freelancer it is all too easy to be overwhelmed by our feelings about idiot producers and non-paying publishers. It’s easy to forget the good things, the reasons why we became and choose to stay a freelancer, the multiple and varied joys of the non-9-to-5 lifestyle. Remember? The New Year is an entirely artificial, man-made construction. You can ignore it or employ it as you wish. But it is important for all working freelancers to be constantly aware of our circumstances and to be vigilant about ensuring we have updated any plans and put into place the latest best options available. Making New Year’s resolutions is as good a time as any to see to all of that. It’s also a good time to offer good thoughts to fellow toilers down the freelancing mineshaft. I look forward to the continuing privilege of sharing some more of my experiences and thoughts on the freelancing life with you on this site. May 2018 bring you employment, good health and inspired dreams. Got a question or an idea for a future column? 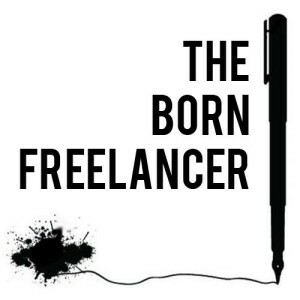 You can now contact the author directly: thebornfreelancer at gmail dot com. Want to share your own New Year’s resolutions? Please use the comments feature below.